Halifax Shipyards to carry out repairs to the vast majority of vessels trading in the North At- lantic area. Shipyards can offer shipowners worldwide a complete service, 24 hours a day, 7 days a week—re- gardless of the vessel's size. It will widen our potential market very considerably." PH M. P. HOWLETT, Inc. since 1875 410 32nd St., Union City, N.J. Phone (213) 549-2550 TWX 910-345 7480 Cable GOLTENS " air services also at Portland. Me . Miami. Fla , Oslo. Baltimore Mobile San Juan, PR. Fort Lauderdale Norfolk Vancouver, B.C. Houston Saint Louis Wilmington, Ca. Canadian dollars ar.d a further 8.5 million Canadian dollars will provide moorings, on-shore infra- structure and other equipment. Scotiadock — which only recently came into operation. This dock (185 meters by 25.2 meters— about 607 feet by 83 feet) has a maximum lifting capacity of 16,000 tons. 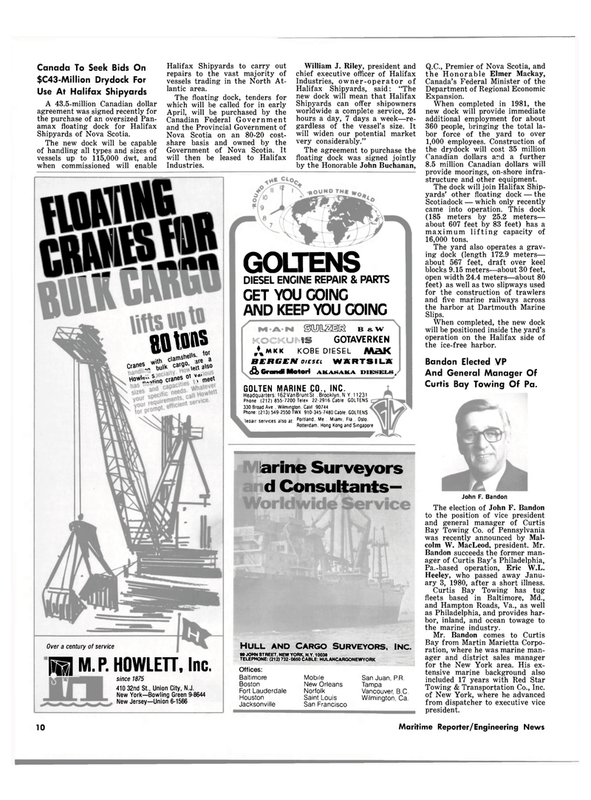 Curtis Bay Towing Of Pa.
Bay Towing Co. of Pennsylvania was recently announced by Mal- colm W. MacLeod, president. Mr.
Heeley, who passed away Janu- ary 3, 1980, after a short illness. Curtis Bay Towing has tug fleets based in Baltimore, Md., and Hampton Roads, Va., as well as Philadelphia, and provides har- bor, inland, and ocean towage to the marine industry.